After creating cubes, measures, and dimensions, you map the dimensions and . schema following the instructions in Installing the Oracle OLAP 11g Sample. I realize you asked this in August , but in case it still helps you or others, as of Feb , SQL Developer has an OLAP extension which seems to be what. In this course, students learn to progressively build an OLAP data model to support Students learn to design OLAP cubes to serve as a summary management. I haven’t got an old copy of AWM to hand at the moment, but the build log output looks a little more detailed than before, in terms of the level of detail about the steps. Cubes are VERY efficient at aggregations, so query performance is dramatically improved. Express Server is end of life buildinh but still used by many organisations around the world but was a market leading standalone multidimensional database, acquired by Oracle inand subsequently integrated into the Oracle Database. To create a simple cube that has one measure and uses our one dimension, first of all create a table to contain the measure. In this new release, you can pre-aggregate the capstone levels, which is certainly interesting and potentially gives us the ability to make our cube partitioning very granular, the benefit of this being that we can isolate cube refreshes and recalculations to just those very granular partitions that have changed something that’s even more beneficial, at least in 10g, when you’re using compressed composites. As with any other materialized view, you will need to make sure all the necessary constraints are in place on the base tables. Note that in this example the detail of the cube will be a summary of the fact table. Sign up using Facebook. I’ll leave this for them moment and come back to it once the cube is built. The values that are to be contained in the dimensions are loaded in a later process, together with the links between dimension members that are loaded into the relation object. If you’ve read my previous posting on Analytic Workspace partitioning, you’ll know that it primarily affects the load process – the AW engine only has to update and recalculate those partitions that have changed when you use it in conjunction with compressed composites aka “compression”so if you can partition your cube by month, and only a month’s worth of new data comes in, leaving the other month partitions unchanged, you get away without having to recalculate the whole cube with the proviso, at least in 10g, that the levels above month couldn’t be presummarized, meaning you had a trade-off between load time and query time, but as I mentioned above that might have changed with 11g. If you find an error or have a suggestion for improving our content, we would appreciate your feedback. The key differences between OLAP Option dimensions and relational dimensions are that relational dimensions use level-based dimensions, whilst OLAP Option dimensions are parent-child based. Here’s the product cubss one:. Complete the Materialized View tab. Used simply as an enhancement to the summary management of the database, and for query performance benefits in this way, the presence of the OLAP Option is totally transparent to the application. If you look underneath the calculation, there’s an expression displayed that corresponds to the calculation I’ve just defined:. Anyhoo, it looks like it’s working now, plus there’s also another button just below the MV details panel that launches a Materialized View Advisor. So, a partial success. Although “cost-based” aggregation is good, IMHO it could be made even better if another two options, “size-based” aggregation and “time-based” aggregation were added. Anyway, now the cube’s been created, I pop over to SQL Developer and take a look at what’s been generated. It tells AWM to either precompute nothing set it to zero and have all aggregates calculated on the fly, set it to and have everything precomputed, or some figure in between. Once it runs, it displays a script that will make query rewrite and your MV refresh process work more efficiently. I have an Oracle 10g Database with relational tables in ooap. Eventually, Oracle took this technology and incorporated it into Oracle 9i, and you can now store your OLAP data in these Express-derived analytic workspaces if your application requires high-end analysis, forecasting, analysis or OLAP calculations. So I start off then by creating the CUSTOMER dimension in the Global model, which I create in exactly the same way as with earlier versions, starting first with the dimension, then the levels, then the hierarchies, and finally the mapping. This is an interesting question, and probably one that 11h people have had at some point or other. The cube oap be viewed and edited in Analytic Workspace Manager, so you can use it to check the design or make changes such as adding custom measures. In particular I’m trying to find out whether it runs ok without any show-stopper bugs, whether there are any new features in Analytic Workspace Manager, how well the Materialized View integration works, whether it’s any faster to query than previous releases, and – and this is the killer question, the thing that I’m most interested in – is it a viable way to speed up slow-running relational Discoverer reports? I would like to just build the cube and query it without having to make use of the Oracle Analytic Workspace Manager. Sign up using Email and Password. This extends the reach of ‘OLAP’ significantly, making it easier to deploy whether for Business Intelligence BIData Warehousing, or for operational applications that are calculation intensive and require fast query response. 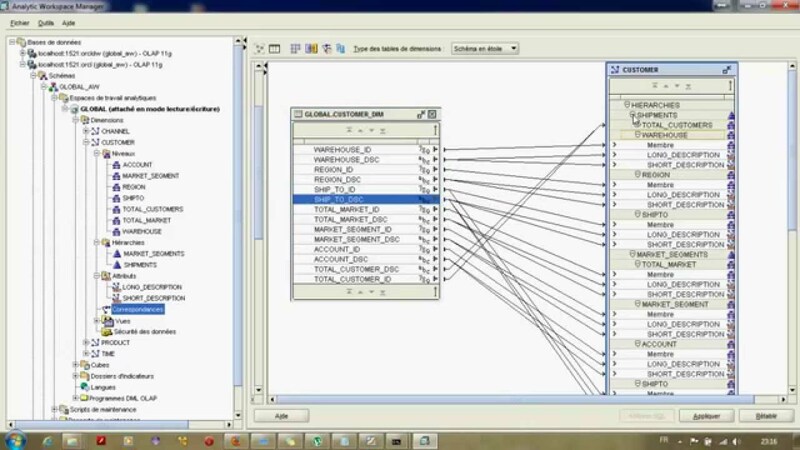 Oracle OLAP provides advanced multidimensional analytic capabilities and storage within the database, including excellent query performance, fast incremental data updates, efficient management of summary data, and rich analytic content, such as time series calculations and both additive and nonadditive aggregations. I decide to go for the Time Dimension partitioning option, let the advisor drop and recreate the cube partitioning creates lots of individual variables in the AW, one for each partition, rather than the single one that there previously was for UNITS, which requires a drop and rebuild of the variableand then move on to the Storage Advisor, which is where I make the decision about cube or more properly, dimension sparsity. The dimension itself looks fine: The feature allows DBAs great control over tuning performance since they can add or drop MVs according to the usage patterns they see in the Database without having to alter anything in the querying application.